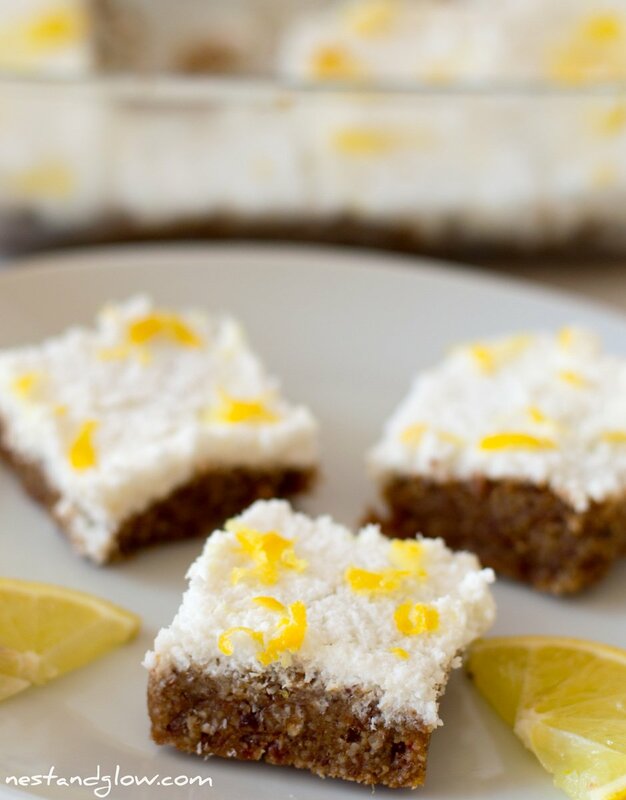 This raw and gluten-free cake is deliciously lemony and moist. 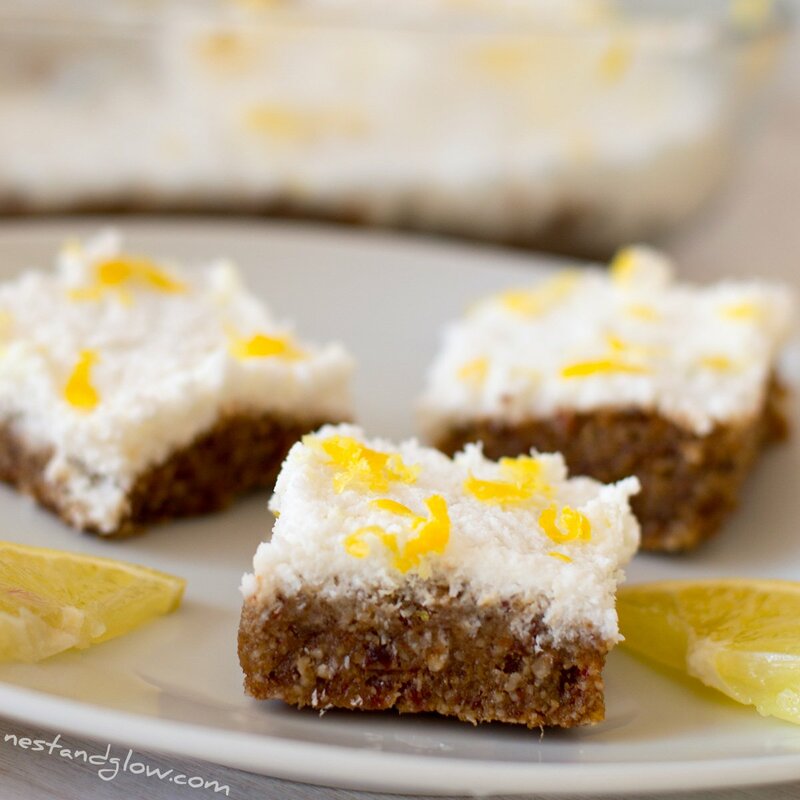 No bake cake topped with a lemon coconut icing and sweetened purely with fruit. You can add a sweetener to the icing if you like, but I do like a slightly sour lemon icing that cuts through the intense sweetness of the base. Maybe this lemon drizzle won’t be the most viral raw cake as it doesn’t look anything special but I think it tastes pretty amazing. Being free of flour, gluten, nuts, oil and just sweetened with fruit it’s hard to find a fault in this healthy raw cake! 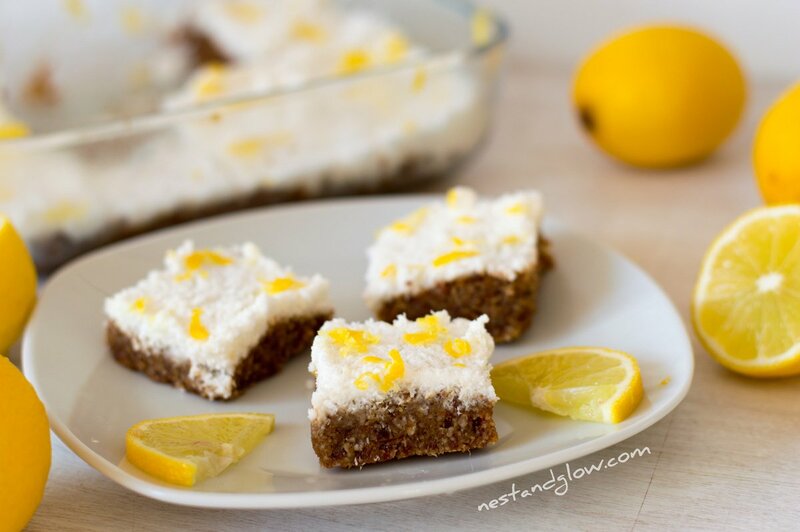 This raw lemon cake uses the lemon zest on top as it contains amazing fragrant and tasty oil. If you can choose unwaxed and untreated lemons if you use the lemon rind in recipes like this. This raw cake is sweetened purely with dried fruit using dates and raisins in the base. You could add a liquid sweetener like maple syrup in the topping but personally, I think it’s sweet enough as it is. I like a slightly sour and tart topping with a very sweet cake base. Many raw cakes can be quite dry, but this lemon seed cake is moist and firm. My lemon seed cake is free of any added oils and is just made from heart-healthy seeds. The topping is not totally smooth, it’s more like fine snow. If you want something smooth then replace the icing with the cashew frosting from my carrot and beetroot cake and add extra lemon. I’m using sprouted and dehydrated sunflower seeds in this raw cake recipe as they are easier for your body to absorb. You can make your own by soaking sunflower seeds in a pinch of salt overnight then drying in a dehydrator for 8-10 hours. Or dry an oven on the lowest possible setting while tossing regularly for an hour or so. It may sound like a faff but I get into the habit of sprouting and drying a big batch of sunflower seeds once a month. I like to use sunflower seeds as they are cheap, full of nutrition and not as moorish as cashews. The raisins can be replaced with any other vine dried fruit like sultanas or currents in this raw cake. The same with the dates as apricots and figs also work well. Raisins are any type of dried grape but sultanas are specifically a white dried grape, and to make matters even more confusing white grapes are green. 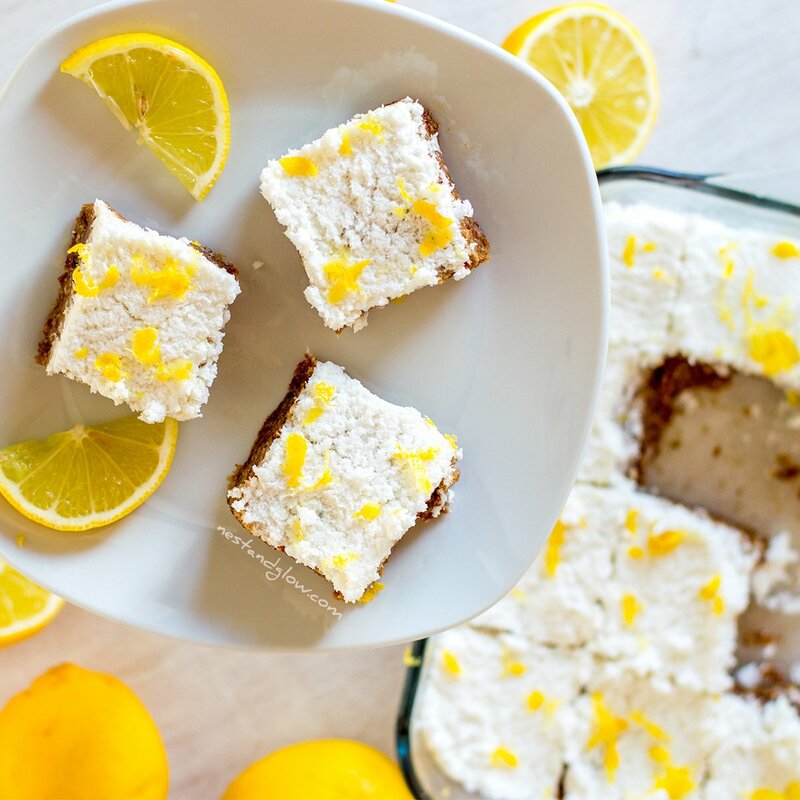 This raw lemon cake recipe does freeze well, just remember to slice before freezing so you can defrost a slice at a time. Into a food processor add the dates, raisins, sunflower seeds and the juice of two lemons. Blend until the raw cake dough starts to form one big ball. Spread this mixture flat in your dish. Place the coconut and juice of the last two lemons into a small blender with a splash of water and blend until creamy. Add just enough water to make a creamy icing that can be spread. Spread the icing on the base and sprinkle with grated lemon zest from 2 lemons. Enjoy this raw lemon cake straight away or place in the fridge to firm up and eat within 5 days. Thanks that’s great to hear! I love this also as its nut free and all the seeds are sprouted.